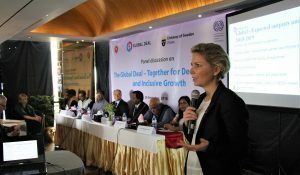 The Swedish and Danish Embassies in Bangladesh together with the ILO hosted a roundtable discussion about the Global Deal social dialogue and industrial relations project (SDIR) in Dhaka, Bangladesh, on 25 September. The roundtable discussion had participation from the Bangladeshi government, employers organisations, trade unions and businesses, all key stakeholders linked to the Global Deal SDIR project. Chief guest was Mr Syed Ahmed, Additional Secretary (International Organization), currently in charge Secretary for Ministry of Labour and Employment from the Government of Bangladesh. The discussion was moderated by the ILO Country Manager Mr Tuomo Poutiainen, and showed good will from all parties to further engage and advance the Global Deal SDIR project. Both achievements and challenges were acknowledged and discussed as were next steps and how to strengthen the partnership. The following day a broader Global Deal breakfast meeting was held with an interesting panel discussion. The event was organized by the ILO and the Embassy of Sweden in Bangladesh. The objective of the event was to introduce, inform and update different stakeholders about the Global Deal initiative. The panel discussion focused on two main subjects – the importance of social dialogue as a way to tackle challenges in the industrial sector of Bangladesh and identifying the opportunities that are created through the Global Deal partnership. A large crowd came to listen to the discussion introduced by the Swedish Ambassador Charlotta Schlyter and moderated by the Global Deal Ambassador Sofia Östmark. Panelists were Mr Shib Nath Roy, Director General at Department of Labour of Bangladesh, Mr Tuomo Poutiainen, ILO Country Director for Bangladesh, Mr Prodip Gabriel Sku, Sustainability Program Manager at H&M, Ms. Shamim Ara, NCCWE Member Secretary, Mr. Nahidul Hasan Nayan, General Secretary of Sommilito Garments Sramik Federation and Dr. Debapriya Bhattacharya, Distinguished Fellow, Centre for Policy Dialogue.